This speech was delivered at a dinner hosted by The Atlantic Monthly for the seventieth birthday of John Greenleaf Whittier, at the Hotel Brunswick, Boston, December 17, 1877. This is an occasion peculiarly meet for the digging up of pleasant reminiscences concerning literary folk; therefore I will drop lightly into history myself. Standing here on the shore of the Atlantic and contemplating certain of its largest literary billows, I am reminded of a thing which happened to me thirteen years ago, when I had just succeeded in stirring up a little Nevadian literary puddle myself, whose spume-flakes were beginning to blow thinly Californiaward. I started an inspection tramp through the southern mines of California. I was callow and conceited, and I resolved to try the virtue of my ‘nom de guerre’. We interrupt this speech for some insightful and humorous videos from Chicago Motivational and Leadership Speaker Conor Cunneen. 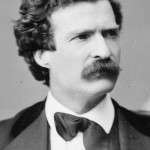 More of Mark Twain below. “Flash out a stream of blood-red wine! They know not well the subtle ways I keep. “‘I tire of globes and aces! —and blamed if he didn’t down with another right bower! Emerson claps his hand on his bowie, Longfellow claps his on his revolver, and I went under a bunk. There was going to be trouble; but that monstrous Holmes rose up, wobbling his double chins, and says he, ‘Order, gentlemen; the first man that draws, I’ll lay down on him and smother him!’ All quiet on the Potomac, you bet! I did not pursue the subject, and since then I have not travelled on my ‘nom de guerre’ enough to hurt. Such was the reminiscence I was moved to contribute, Mr. Chairman. In my enthusiasm I may have exaggerated the details a little, but you will easily forgive me that fault, since I believe it is the first time I have ever deflected from perpendicular fact on an occasion like this.